· Colour is found by turning the diamond onto its table. Minor color variations are more visible through the pavilion (bottom part of the diamond) at a 45 degree angle which is why most diamonds are graded face down. · Diamonds of F-H Colour are the best value. Face-up they are clear as day and there is no hint of yellow. · D & E Colour is fantastic, but the D colour is exceptionally rare and as such the largest price jump in the color range occurs here. · I & J Colour diamonds beautiful once they are placed in a setting. If size is your priority then these color grades will get you there without compromise. · If size is a must and clarity is stretched to the max, then a diamond of L-N range will still have beautiful sparkle and appeal with the light hint of color that is reminiscent of candle light on a late summer’s night. The levels of the GIA Color Scale can be divided into Colorless, Near Colorless, faint yellow, very light yellow, and light yellow ranges. Each letter on the scale represents a narrow color range, not a specific point. And each masterstone marks the highest point--or least amount of color--in that range. 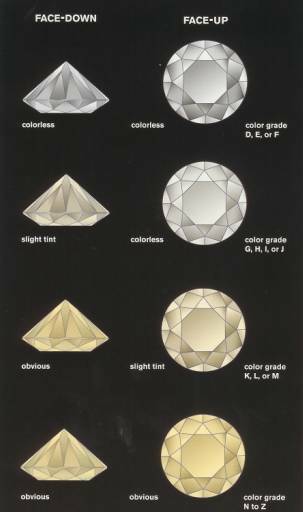 Diamonds in the normal color range (D-Z) are graded based on their lack of color. Because minor color variations are more visible through the pavilion at a 45 degree angle which is why most diamonds are graded face down. This also reduces the brilliance and fire that can often make it tricky to see the color on its own. The D-E-F grades are considered colorless. D and E diamonds have virtually no color, and an F has a nearly undetectable amount of color that shows only in the face down position. The differences between these grades are actually very slight. In fact, they're almost indistinguishable in diamonds smaller than .25ct. The G-H-I-J grades are near-colorless. Diamonds with these grades look colorless face-up and nearly colorless face-down. They have slight traces of color that aren't noticeable to untrained eyes when the stones are mounted. These diamonds are popular because the combine fairly high color with somewhat lower prices. The K-L-M grades are faint yellow. Diamonds in this range show very faint yellow color face-up and face-down. When they're mounted, small stones look somewhat colorless, but larger stones show a faint hint of yellow. N through R diamonds are considered very light yellow. They appear very light yellow face-up and face down, even when they are mounted in jewelry. S through Z diamonds are light yellow. They show substantial color face-up or face-down, loose or mounted. Once a diamond goes beyond the Z color range, it's classified as Fancy Light yellow, which causes its price to rise. Sometimes, diamond rough with color in the X to Z range can be cut to achieve a fancy color designation. This chart is an oversimplification of the grades and the classification groupings that most people are aware of.